198 x 145 mm. – 137 leaves. This manuscript was written and decorated in 1415, evidently for Master Gerrit Williamson, and presented by him to the Tertiaries of St. Margaret, Amsterdam (Margarietenconvent). 198 x 145 mm. – 137 Blätter. Hoe God ghesocht wert (How God was sought) are the first words in this manuscript that was completed in 1415. 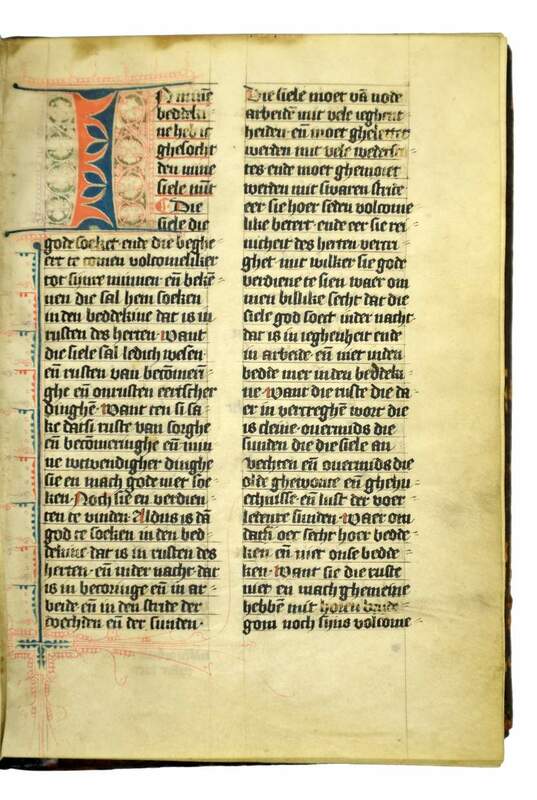 The text is a Middle-Dutch translation of the commentary on the Song of Songs, the Explicatio or Expositio in Cantica Canticorum, attributed to (pseudo-) Richard of St. Victor. It deals with bridal mysticism and provides a guideline for female monastic life. A later hand added: Dit boec hoert toe den susteren van sinte margrieten binnen amstelredam. Partly erased, further information tells us that it came from Master Gerrit Willemszoon. The nuns of St. Margaret in Amsterdam lived in a house built in the yard of master surgeon Gerrit. In 1420, two years after his death, Gerrit's mother handed over all his books to the nuns during a presentation in the chapel of the Amsterdam monastery of St. Paul. Friar Dirk van Voorst, the sisters' rector and confessor, received the books. Dialect and decoration suggests that this manuscript was written by the Regular Canons of Windesheim (near Zwolle) in the eastern Netherlands. Windesheim was the parent house of the monastic branch of the Devotio Moderna, whose followers earned their living by copying books. The present manuscript closely resembles another copy of the same text (Amsterdam, University Library, ms. 65-33), which is dated 1418 and also came from Zwolle before it turned up in Amsterdam. These manuscripts are testimonial to the influence of the Devotio Moderna at a time when hardly any books were known from Amsterdam, a minor town in the early 15th century. This Expositio manuscript is a key witness in the history of the Devotio Moderna in Amsterdam. This work is now in the collection of National Libary of the Netherlands at The Hague. Bürozeiten: Montag bis Donnerstag, 9–18 Uhr. Ihren Besuch erwarten wir gerne nach Vereinbarung. Das Antiquariat ist während der Osterferien vom 22. bis zum 26. April 2019 geschlossen.